The Barcelona-born driver couldn´t secure his second consecutive podium finish as the clutch burned out when his teammate Forné was at the wheel of his Car Collection Motorsport-entered Audi R8 LMS. Tutumlu, Forné, Díaz-Varela, Schmidt and Parhofer were leading their class and running in the top ten when they retired. 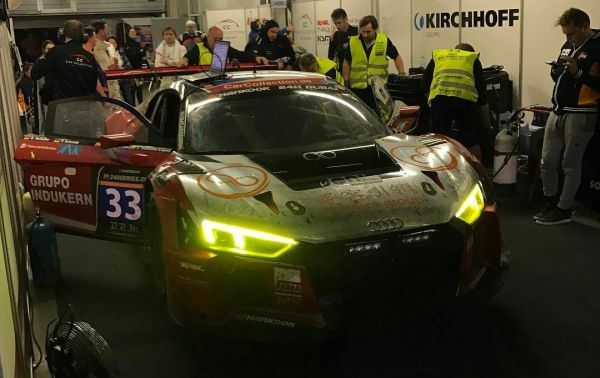 Isaac Tutumlu and his teammates didn´t have Lady Luck on their side at the 24 hours of Dubai and clutch issues in his Audi R8 LMS ended the race early for Car Collection Motorsport. Tutumlu, Toni Forné, Daniel Díez-Varela, Peter Schmidt and Dimitri Parhofer secured second place in A6-Am class in qualifying and it wasn´t long before Forné and Díaz-Varela shot into the lead with excellent opening stints. Then, both Schmidt and Parhofer started their first stints and the latter finally handed over to Tutumlu. Isaac put on a perfect performance and, seven hours into the race, the Audi racing under the Car Collection Motorsport banner was leading A6-Am class and ran 7th overall. But unfortunately the team hit problems into the night. In the words of Tutumlu, “the clutch burned out. After Toni got hit by another car and spun on turn 1, the engine ran backwards because the automatic clutch did not work. After 249 laps, the 24 hours of Dubai came to an early end.